All accepted papers of International Research Conference on Education, Language and Literature (IRCEELT) will be published in the conference proceedings book with an ISBN reference in both paper and in e-Proceedings format. Papers will be accepted only by electronic submission through the conference web site. 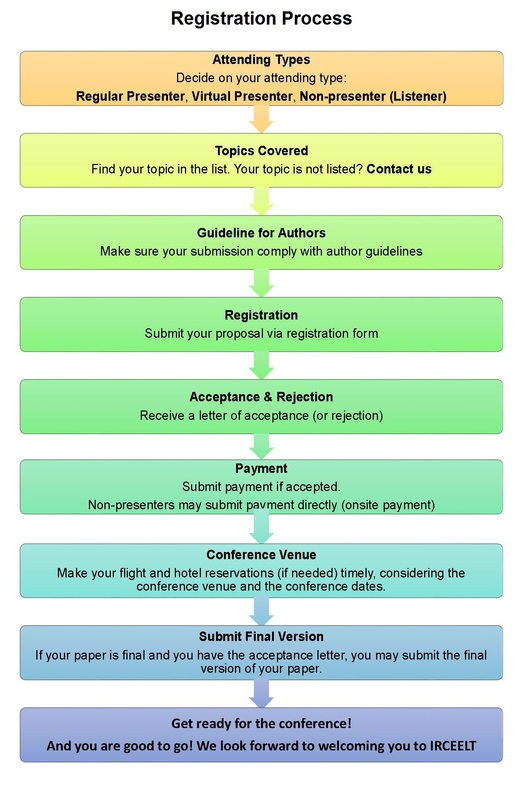 At least one of the authors of each accepted paper must register as a full participant, currently a part of the abstract submission form, and present paper in person to have the paper published in the proceedings. For more information on the electronic submission and formatting instructions given on template are available at the conference website at Full Paper Template. Original papers that are not being submitted to journals or other conferences will be considered. All submitted papers will be evaluated according to its originality, significance, accuracy, presentation and relevance. We encourage authors to present novel ideas, a critique of existing work, and practical studies and experiments. Notifications: You will be notified via email of the status of your abstract in 10 working days after submitting the abstract. Withdrawals: If you choose to withdraw your abstract, please email your request before the deadline of abstract submission. After this date, your abstract will be published exactly as it was submitted. Regular Author Registration Includes: Paper Presentation, Proceedings Volume (where your paper is published), E-Proceedings, Attendance to all Sessions, Conference Program, Name Tag, Coffee Breaks, Lunch, Certificate of Participation and conference pack. Each presentation is allowed 25 minutes (including questions and answers), scheduled in incremental one to two hour sessions. We recommend that you use 20 minutes for presentation and 5 minutes for Q&A. Conference rooms are equipped with computers and data projectors. The computer will be set up for PowerPoint presentations (Mac users are asked to save their presentations in a compatible format). Presenters are expected to bring their presentations on a USB flash drive. We recommend copying presentations to the computer in the conference room before the session starts. Certificates of presentation will be presented by the session chairs after each session. Presenters are encouraged to chair the session they are presenting at. You can volunteer to chair the session on the registration form. If you cannot attend IRCEELT Conferences but still wish to have your paper presented at the conference and published in the conference abstract/proceedings book, we offer a virtual presentation option for your convenience. Virtual presenters are expected to record a voice-over PowerPoint and email it to us one week prior to the conference at the latest. Virtual presenters are still required to submit a proposal/abstract or full paper, and one author(s) must pay the registration fee. Your conference documents will be sent to your email address after the conference. In accordance with academic and professional protocols and the IRCEELT requirements, IRCEELT International Conference cannot accept a paper if it is not the author’s original work, has been published before, or is currently under consideration for publication elsewhere. The article must not contain any libelous or unlawful statements or in any way infringe the rights of others. All authors must declare they have read and agreed to the content of the submitted paper. IRCEELT defines plagiarism as the use of someone else’s prior ideas, processes, results, or words without explicitly acknowledging the original author and source. Plagiarism in any form is unacceptable and is considered a serious breach of professional conduct, with potentially severe ethical and legal consequences. If an author is found to have committed plagiarism, sanctions may be applied by IRCEELT. Individuals whose names are placed on the IRCEELT Prohibited Author List will not be allowed to organize or lead any IRCEELT sponsored activities including but not limited to attending invited conference sessions, distinguished lectureship, editorship of IRCEELT publications, and paper reviewer for IRCEELT. The IRCEELT International Conference may use the CrossCheck plagiarism screening service to detect instances of overlapping and similar text in submitted manuscripts. CrossCheck site is a multi-publisher initiative to screen published and submitted content for originality. Presenters must be at the designated room of your session 5 minutes before it begins so that you can meet your session chair and the other speakers in advance. It is most important to be within strict time constraints to allow the presentation to fit within the allotted time period. The session chairperson will ensure that these time limits are strictly observed. Each paper has an estimated time slot up to 25 minutes for presentation including questions and answers. Presenters should bring their compatible presentation files stored on a USB-drive/CD-ROM/DVD. Presenters are kindly requested to upload their files on the computer at least before the start of the session or bring their own laptop. Presenters are also kindly requested to test the functionality of the presentation before the beginning of the session. If an author is not sufficiently fluent in English to present his paper, paper can be presented in his/her native language getting support from colleagues for summarizing translation. Contributed oral presentations are 25 minutes long, including 5 minutes for questions and discussion. The paper must be presented by one of the author or co-authors. Oral presentations are to be made either using your laptop or the PC that will be available in the session room (Windows system + Power point). There will be a volunteer on hand to assist in starting each presentation. Maximum poster size is 70 cm wide by 100 cm high. You must provide your own printout of the poster itself. You are requested to set up your poster before the session and remove it at the end of the session. One of the paper author or co-authors must be present and available for discussion at the poster session. Posters will be on display in the conference room. Papers that are not presented by their authors at IRCEELT Conferences are not published. It is essential that the IRCEELT Conferences attendees have an opportunity to discuss your work with you. IRCEELT non-presented paper policy: IRCEELT Conferences organizing committee reserves the right to exclude a paper from distribution after the conference, including IRCEELT e-proceedings, if the paper is not presented by the author at the conference. In registering for the conference you agree that neither the Organizing Committee nor the Conference Secretariat accepts any liability. For people planning to attend the conference, an entrance visa may be required and you should contact the nearest Embassy or Consulate for more information. Participants are requested to make their own arrangements in respect of health and travel insurance if needed. The organizers do not accept responsibility for any personal injury, damage or loss of property which may occur in connection with this conference. All participants are advised to arrange international health insurance before departure from their home countries. The IRCEELT International Conferences organizers reserve the right to cancel the conference and/or tutorials due to unforeseen circumstances. Liability of IRCEELT Conferences is limited to return of conference and/or tutorial fees. Should you be unable to attend, a substitute participant is welcome at no extra charge, but you need to notify the conference organizers in advance. For cancellations on or before the registration deadline, a 50% refund will be made and transferring service fee is paid by the receiver. No refund will be made for cancellation after the registration deadline.